Judging by discussion at the Historic Preservation Board meeting this week, the Tree of Life sculpture in front of the Faena Forum has a lot of fans. The community enjoys it. Tourists flock to it for photos. And following news it might have to move, City Commissioner John Alemán posted on her Facebook page how much she loves it. The HPB noted its appreciation for the artwork as well but stopped short of allowing it to remain in its location permanently, instead giving it a temporary reprieve and recommending the City Commission amend the code to allow for sculptures as encroachable elements in the Faena Arts Overlay District. Almost immediately, the amendment found a sponsor in Commissioner Alemán. 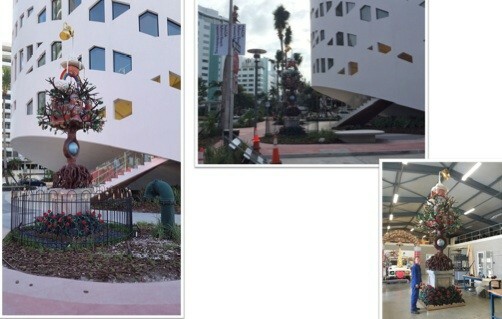 Owners of the Forum installed the sculpture during this past year’s Art Basel event. The problem: its location does not meet the setback requirements for front yards. The sculpture currently sits on a concrete foundation with a 6’3” setback from the property line along Collins Avenue where the required setback is 20’. Planning staff recommended moving the sculpture to another location, but the owners told HPB that the Forum’s subterranean parking garage and its roof construction prohibit placing the cement slab any further back from the property line. They were seeking a variance based on hardship given the unique shape of the property which they say makes relocation within the site impossible. Board members did not feel the situation warranted granting a hardship and worried that doing so would set a precedent for other properties “to push the limit”. The recommendation for a code amendment is in keeping with the vision of the Faena District, which is dedicated to art and the display of art, according to the HPB. The Board approved the Certificate of Appropriateness pending an application to and action by the Commission on a code amendment allowing sculptures in the District and then recommended the Commission take it up based on the historic connotation of the Faena District. If passed, the appropriateness of sculptures would still require approval by the HPB but would not require variances and showing hardship for each installation. The 20 foot tall sculpture was created by Studio Job, an internationally recognized design house. Moxy Hotel: The project proposed for the 900 block of Washington Avenue was approved by the HPB. It has already been approved by the Planning Board. Project details. The owners requested a continuance in order to resolve issues with its neighbors. It is expected to return in March. Project details. Applicants requested continuance to March after beginning previously permitted repair work that ultimately required minor demolition to replace rotting floors. The application needs to be amended to include a request for after the fact demolition. Application and variances requested. Details. Related: 1436 Drexel Ave, the Matanzas Hotel which is part of the Clay Hotel and just West of the main building. The Board approved the request for a variance to maintain the size of the hotel rooms which are smaller than current code allows. Increasing the size of the rooms in the historic structure would have meant substantial changes in window placement. Regarding design, members expressed approval for most of the ideas put forth by the owners but struggled with the proposed enclosure of the lobby that has an open entryway. Due to moisture issues, maintaining the interior is difficult and the application before the HPB proposed enclosing the space. Board members expressed their understanding of what is a common issue here but asked the owners and architects to do their best to find a solution that is more in keeping with the historic use of the open entry and, if they can’t, to show they had exhausted all options. The Setai at 2001 Collins Ave was approved to reintroduce retail entrances along Collins Ave. Details.